[updated April 13] Federal Aviation Administration (FAA) officials say that loss of control over an Intelsat geostationary (GEO) carrying a GPS Wide Area Augmentation System (WAAS) transponder could subject users in the National Air Space (NAS) to temporary outages for the rest of this year, beginning within the next two to four weeks as the GEO drifts out of a useable orbit. Intelsat S.A. announced the anomaly in Galaxy 15 (G-15) on April 8. Although the communications services provided by G-15, located at 133 degrees west longitude (WL), have not been affected, according to Intelsat, the satellite apparently is not responding to commands by controllers. The anomalous condition began on April 3, according to the FAA. The Luxembourg-based Intelsat is moving an older spacecraft (G-12) that serves as a backup for G-15 from its location at 123 degrees WL. However, G-12 does not have an L-band transponder, which is needed for WAAS transmissions. G-15 is one of three GEOs currently in orbit that provide WAAS services (see accompanying graphic) and provides the farthest coverage west across much of the Pacific Ocean. In terms of absolute U.S. service coverage, WAAS signal unavailability will only occur at 16 airports in northwestern Alaska. The impending outage would have caused those sites to lose the capability to support aircraft approach and landing procedures based on localizer performance with vertical guidance (LPV, sometimes called “lateral precision with vertical guidance”). However, none of those airports has a published LPV approach yet. Aviation users in the NAS outside the affected area will continue to have LPV service, according to the FAA. LPV is the highest precision WAAS-enabled aviation instrument approach procedures currently available without specialized aircrew training requirements, such as required navigation performance (RNP). Landing minima are similar to the instrument landing system (ILS), that is, 200 feet decision altitude and half-mile visibility. Pilots flying into the 16 Alaska airports will still be able to use GPS-based published lateral navigation (LNAV) approaches so long as they check on the availability of receiver autonomous integrity monitoring (RAIM) before they depart on a flight, Leo Eldredge, the FAA’s GNSS program manager, told Inside GNSS. RAIM requires a minimum number of GPS satellite signals to be available in order to work. 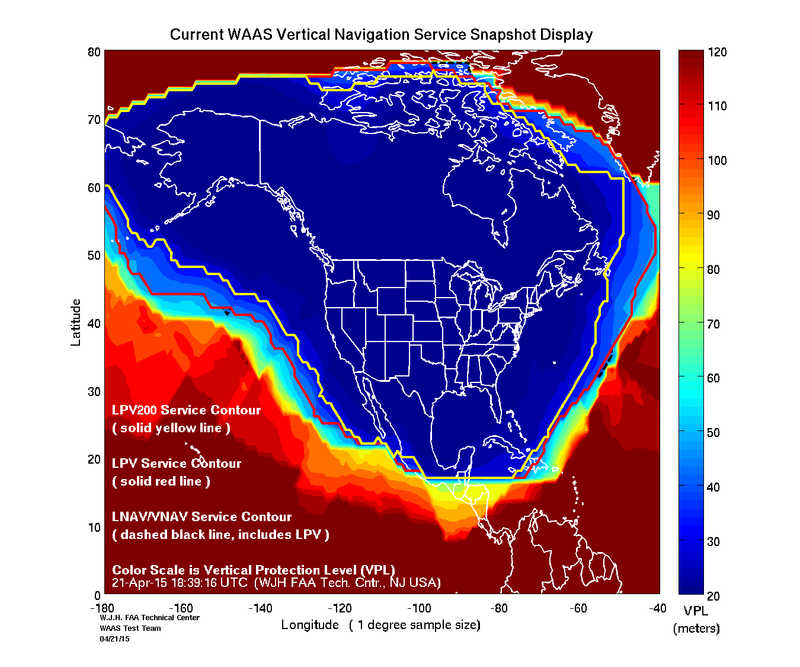 Due to a lack of redundant GEO coverage, however, WAAS users may experience temporary service interruptions — for example, during WAAS GEO uplink station (GUS) switchovers — until a new GEO comes on line. These switchovers may occur three to five times per year, according to the FAA, and require up to five minutes to restore LPV service. The risk of a single-point WAAS failure will exist in some areas until redundancy is restored to the system. The FAA only began tests a few weeks ago on a newly leased transponder on one of the other two spacecraft, Inmarsat 4F3 (broadcasting on PRN-133). Called the Gap Filler, the 4F3 GEO will ensure all of the continental United States and most of Canada and Alaska have redundant coverage. Among those alternatives is re-integration of the Inmarsat-III Pacific Ocean Region GEO that was formerly used by WAAS prior to switching to Intelsat. FAA is also considering accelerating acquisition of an additional GEO using funds saved from the loss of the Intelsat G-15. The G-15 satellite primarily provides transmission capacity for cable programmers in North America. Based on current technical information, Intelsat says it expects no service interruption for the media customers on this satellite. All media traffic on this satellite is planned to be transitioned to Intelsat’s Galaxy 12 satellite, when it arrives at 133 degrees WL around April 14. However, the company has not announced any plans regarding the L-band service. Launched in 2005, G-15 is an Orbital Star model built by Orbital Sciences Corporation and designed to be operational through 2022.